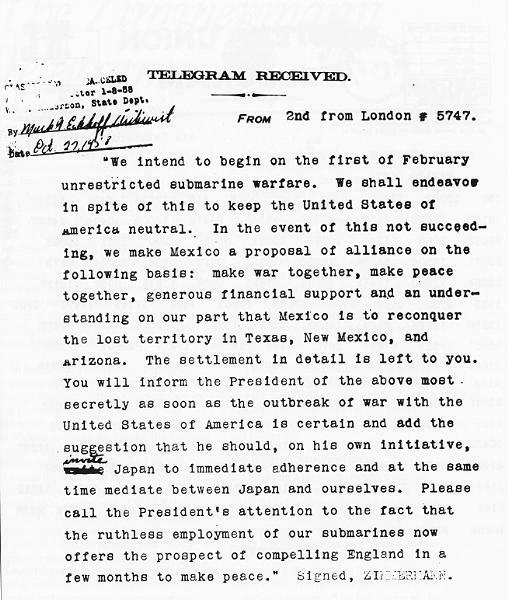 The decoded Zimmermann telegram to the German ambassador in Mexico. Britain: Royal Navy Room 40 deciphers Zimmermann Telegram full text, shows it to US Embassy, Balfour gives Hall free hand on February 20. Flanders: British take 114 PoWs in raid east of Ypres. Somme: Germans with flamethrowers capture British post and 30 PoWs south of Le Transloy. East Africa: NRFF engages Kraut’s rearguard near Litembo and Captain Wintgens’ 500 men, 3 guns and 13 MGs near Tandala, saving that post (Wintgens heading north on own solo raid ­until October 2).